In this pAsuram maNavALa mAmunigaL, who knows the heart of SrI rAmAnuja and speaks on his behalf. maNavALa mAmunigaL knows what SrI rAmAnuja is thinking and pours it in this pAsuram. He concludes with the request to SrI rAmAnuja about quickly granting him the ascendancy to paramapadham. SrI rAmAnuja is thinking “This person maNavALa mAmunigaL has committed lots of sins right from the day he came to me. If not for me, will there be any other person who can protect him in spite of his huge repository of sins? There might not be any one and so we should protect him”. This thought of SrI rAmAnuja is what maNavALa mAmunigaL is reproducing in this pAsuram as if it is coming from his own heart. maNavALa mAmunigaL, in continuation says who other than SrI rAmAnuja could protect him, being the only refuge for all people without any shelter whatsoever. Can the ever compassionate people that include the likes of periya perumAL protect me? maNavALa mAmunigaL says that it was SrI rAmAnuja who kindled the desire to go to the ultimate destination of paramapdham. Hence, he requests that it has to be SrI rAmAnuja who needs to ensure that he reaches there. In addition to it, maNavALa mAmunigaL says that it is SrI rAmAnuja’s thought that he ought to protect him from those innumerable sins that he commits daily. maNavALa mAmunigaL believes that it is not periya perumAL etc who are trying to protect maNavALa mAmunigaL, instead it is SrI rAmAnuja who is pining to save him from all sorts of sins and no one else”. ennudaiya pizhai poRukka yAvarukku mudiyum? thangaLukkumAmO? – will they be able to do it? ennudaiya – that I committed? unakku anRi – except you. oLivisumbil – bright and resplendent paramapadham. E – (at the end of viraindhu) – is a suffix added for the sake of completion. 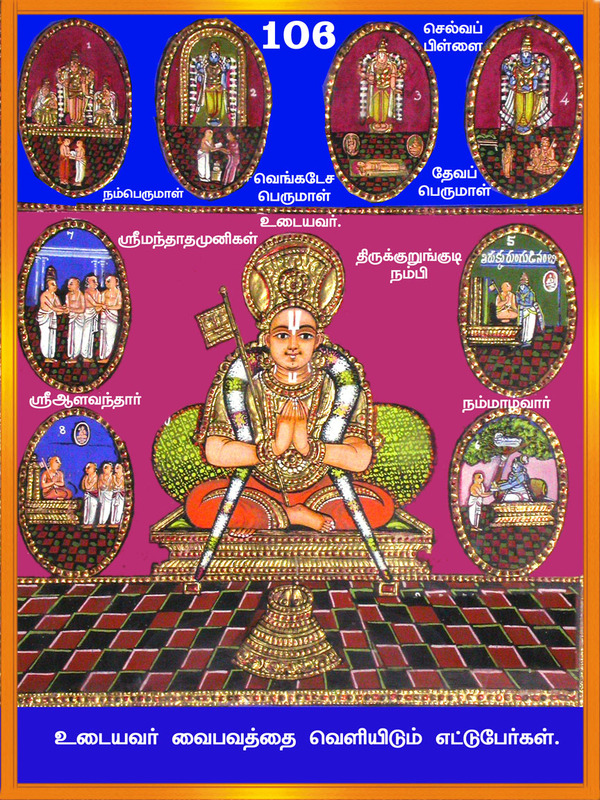 maNavALa mAmunigaL talks about the cream of cream people including the likes of periya perumAL, HIS divine consorts, nithyasUris, AzhvArs and other AchAryas except SrI rAmAnuja. He says that none of them has the means to protect him and thereby forgive his sins. Only SrI rAmAnuja has the capability and compassion to do so. maNavALa mAmunigaL explains this thought of SrI rAmAnuja, concluding by requesting SrI rAmAnuja to take him to paramapadham and be one among the people there. maNavALa mAmunigaL says “Oh! The leader of yathIs!!! Even the omnipotent Lord who knows everything without the help of anything or anyone, cannot fathom the sins that I have committed. Is there any one who is capable of forgiving my sins? Will the periya perumAL, who is described by the phrases, “dhOshAyadhyabhithasyasyAth” and “en adiyAr adhu seyyAr seydhArEl nanRu seydhAr (periyAzhvAr thirumozhi 4.9.2)” be able to forgive my sins? My sins will test even HIS patience. Will, the set of pirAttis starting from periya pirAtti, who is described as “nakaschin naparAdhyathi (srIrAmAyaNam)” and “kimEthan nirdhOsha: ihajagathi (SrI guNa rathna kOsam)”, be able to patiently forgive my sins? Will, the nithyasUris, starting from the likes of sEnApathiyAzhvAn etc. who have yearned and got the eternal service of periya perumAL and HIS pirAttis, be capable of forgiving my sins? All these nithyasUris are one and the same when it comes to doing eternal service to perumAL and pirAtti, as shown by “asmAbhis thulyObhavathu”. They are the people who talked about prapaththi in “vishvaksEna samhithai” and “vihakEndhra samhithai”. Will any of those nithyasUris, be able to forgive my sins? Will nammAzhvAr, who, forever, is replete with auspicious qualities of vAthsalyam to devotees, and who stands by it as revealed by the phrase “payananRAgilum pAngallarAgilum seyal nanRAgaththiruthip paNikoLvAn (kaNNinun chiruth thAmbu 10)”, be capable of forgiving my sins”? Will thirumangai AzhvAr, who showers his choicest blessings on all chEthanas (anything with consciousness), be capable of forgiving my sins? Will it be possible for all krupAmAthra prasannAchAryas, who are recipients of AzhvAr’s blessings, starting from nAdhamunigaL, yAmunamuni and the like, to forgive my sins? Except for you, SrI rAmAnuja, who bears and forgives any sin patiently, will any one of the aforementioned elite people be able to forgive my sins at all? It is not at all possible for them to forgive my sins. Hence, going by the phrase that describe you as “nigarinRi ninRavennIsadhaikku nin aruLingaNanRip pugalonRumillai (rAmAnusa nURRanthAdhi 48)”, you are verily the ocean of compassion and the one who forgives and protects everyone with the huge baggage of sins anyone may have. So, it is only appropriate for me to say that I belong to you and to no one else”. maNavALa mAmunigaL continues, “It is because of your blessings that, the surrender unto your lotus feet, was possible. Likewise, after surrender, it is because of your blessings again that I got interest in reaching the ultimate destination (prApyam). I request you to take me to paramapdham that is described as “sudaroLiyAi ninRa thannudaichOdhi (thiruvAimozhi 3.10.5)” and “theLivisumbu (thiruvAimozhi 9.7.5)” and make me one among them there. Without making me an outcast from those people in paramapdham, as described by the phrase “anguRREn allEn (thiruvAimozhi 5.7.2)”, I request you to quickly give me ascendancy to paramapadham. The word “unakkanRi” (except for you) can be connected with both “thennarangar…..ethirAsa” and “yAn oruvarukku AgEn”. (This would convey the meaning that except SrI rAmAnuja no one is capable of forgiving the sins committed by maNavALa mAmunigaL and except SrI rAmAnuja maNavALa mAmunigaL is not for anyone. The reasons why the aforementioned elite league of people may not be able to completely tolerate, forgive and protect maNavALa mAmunigaL from his sins is explained below. Lord Sriman nArAyaNan is someone who is characterized by the character called total independence without any cause (nirankusasvAthanthriyam). HE can be independent at any time that HE chooses and may punish a person for his sin, as revealed by “kshipAmi” and “nakshamAmi”. The set of pirAttis are described by the phrases “kshAmA lakshmI bhrungIsakala karaNOnmAthanamadhu” and “thimir koNdAL oththu niRkkum (thiruvAimozhi 6.5.2)” mean that they may be overly absorbed with their Lord that they may be resemble a statue. They may not be in a situation to forgive my sins. When it comes to nithyasUris who are always in the eternal service to the Lord and HIS divine consorts (the set of pirAttis), they would always care for any danger to the Lord and their divine consorts, even it is out of place or out of time. The nithyasUris might be in constant fear of any lurking danger for the Lord and their consorts, as described in “AngaravAram adhu kEttu azhalumizhum (nAnmugan thiruvandhAdhi 10)”. Hence, they may not be able to protect / forgive the sins of maNavALa mAmunigaL. Next up are AzhvArs who always yearn for the kainkaryam at the lotus feet of the Lord and pirAttis. In doing so, they become ecstatic at times and forget themselves owing to their great bhakthi (devotion) to the Lord and His consorts. The AzhvArs are epitome of bhakthi as described by the phrases “sindhai kalangi thirumAL enRazhaippan (thiruvAimozhi 9.8.10)”, “unnaikANum avAvil vIzhndhu (thiruvAimozhi 5.7.2)”, “unnaikkANum Asai ennum kadalil vIzhndhu (periya thirumozhi 4.9.3)” and “bhakthi pAravashyaththAle prapannargaL AzvhArgaL (SrI vachana bhUshaNam 43)”. Hence, they may not be capable of forgiving me and my sins. Lastly, the group of mumukshUs (those who have the interest in attaining mOksham or paramapdham) are people who follows the code of conduct (the do’s and don’t’s) as long as they are in a body. Till their mortal coils falls on the ground, they are supposed to yearn about mOksham and supposed to be doing that at all time. Hence, they are not entitled this job of advising other people, forgiving others sins etc. However, SrI rAmAnuja is beyond these limitations of others when it comes to protecting someone from their sins. He is someone who, looks at the misfortune of samsAris, and protects them, even if it means to finish himself. He does not look at their knowledge or lack of it. He protects them and forgives all sorts of sins that one may have committed. In addition to doing this, he makes sure that he gets the character of singing mangaLAsAsaNam to the Lord as per “ALumALar engiRavanudaiya thanimai thIrumpadi (thiruvAimozhi 8.3.3)”. So he is the one who rectifies a person that were deemed as “cannot be reformed” as per the phrase “adhu thiruthalAvadhE (periya thiruvandhAdhi 25)”. Eventually he ensures that that is person does eternal service at the Lord srIman nArAyaNan who is described as “thirumagaL kElvan”. thiruvarangaththu amudhanAr also sang about this in “maruL koNdiLaikkum namakku nenjE irAmAnusan seyyum sEmangaL maRRuLAr tharamO (irAmAnusa nURRandhAdhi 39)” in this regard. This entry was posted in Arththi prabandham, Other and tagged arththi prabandham, emperumanar, mamunigal, ramanuja on September 27, 2016 by santhanam rajagopalan.